ARF | Cats | I'm Mochi, Adopt Me! 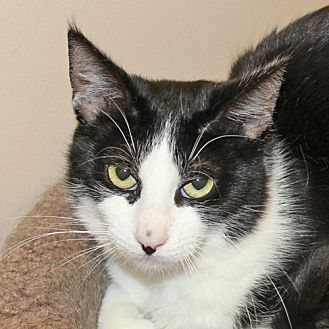 One-year-old Mochi is an adorable young tuxedo boy who starts out timid, but just loves soft petting! Once he is ready, he will also enjoy interactive playtime with wand toys. Mochi is a gentle little fellow who is looking forward to settling in to your quiet, calm home, where he is sure to blossom into a fun companion. Mochi's adoption fee has been prepaid by a generous donor. Mochi's adopter must be at least 18 years old with valid-state issued identification. ARF encourages family members to participate in the adoption process, especially children. Please visit ARF's web site for information on adoption and to view more great cats. 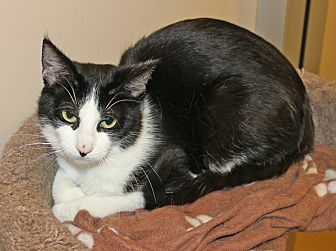 [description] => One-year-old Mochi is an adorable young tuxedo boy who starts out timid, but just loves soft petting! Once he is ready, he will also enjoy interactive playtime with wand toys. Mochi is a gentle little fellow who is looking forward to settling in to your quiet, calm home, where he is sure to blossom into a fun companion. Mochi's adoption fee has been prepaid by a generous donor.